The Cantina by Campbells is giving away free soup! Mother Nature has been kind to Torontonians this winter, yet there are still evenings when the wind picks up and an unescapable shiver runs through my body. For those also stuck with a chill, you’re in luck if you’re traversing the Queen and Spadina area! 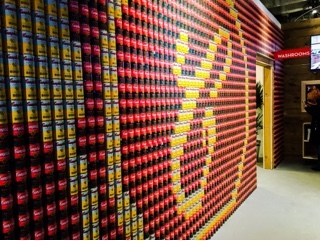 Campbell’s has set-up a pop-up eatery at 501 Queen Street West. 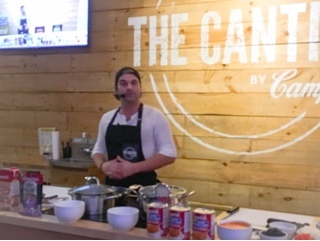 At The Cantina, you’ll be treated to four bowls of delicious soup concocted by the Rock Lobster King, Chef Matt Dean Pettit. A garnishes bar allows diners to add a host of ingredients to their soups to really make it their own … feel free to load up on as much fried noodles as you’d like! 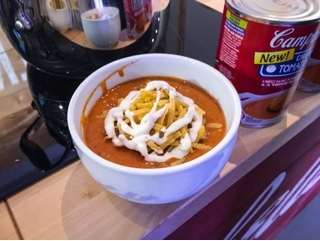 Best part, if what you’ve sampled is delicious, pick up the recipe pamphlet and recreate the soup using Campbell’s broths, soups and soup kits. Attending as a guest of Foodaholic, I had the opportunity to actually cook two of the soups with Chef Pettit; aside from chopping vegetables and chicken, it was relatively easy to whip up. Now that I’m armed with chicken broth and the Thai and Rice soup kit, I’ll be attempting to recreate the Thai chicken and rice khao soi at home. Spicy vegetarian ramen – inspired by the Japanese noodle dish where the hearty broth is just as important as any other ingredient. 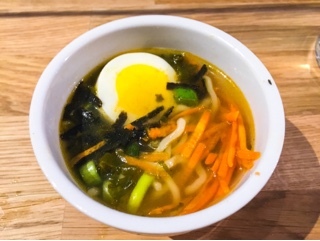 Visitors can top the vegetarian broth and ramen with a host of ingredients including hard-boiled egg slices, green onion, nori, bamboo shoots and carrots. Of all the soups this was the lightest and really refreshing to me. Creamy tomato black bean taco – a Mexican inspiration using creamy tomato soup, tomatoes, black bean, onion, cumin and lime. With all the spices you can only imagine how great this soup smells! On top some crunch tortilla chips for contrast and chili lime crema. 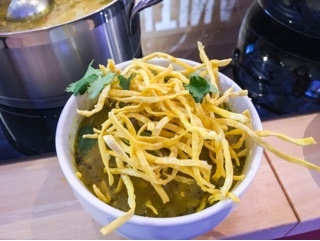 Thai chicken and rice khao soi – my favourite soup of the night, using the soup kit (containing rice, dehydrated vegetables and spices), along with chicken broth, egg noodles, shallots, garlic, curry powder, coconut milk, mushrooms. On top tons of crunchy egg noodles that when combined with the soft noodles and rice has such a nice contrast. 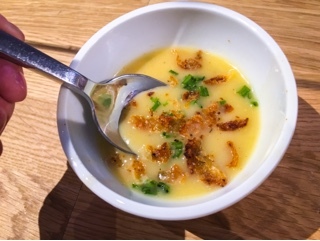 Roasted beer can cream of chicken – the soup that had an unexpected kick of heat likely on account of the rub used on the roasted beer can chicken. It’s a hearty meal in a bowl made from cream of chicken, carrots, onions and celery. But, it’s the pieces of crispy chicken skin and chives on top that kill it. The Cantina is a spacious brightly lit environment with tons of whimsical pictures and artwork made of old fashioned soup cans. It was from the event I learnt that the company has been operating in Canada for 85 years! A few communal tables are situated at the front providing the ideal opportunity for strangers to meet and talk while enjoying their meal. I bid you good eats and remember: We All Soup!